As the partial government shutdown churns along with no end in sight, a controversial bill that would criminalize pro-Palestinian advocacy has stalled in the Senate as Democrats balk over considering any bill that fails to reopen the government. On Tuesday night, Senate Democrats blocked the Strengthening America’s Security in the Middle East Act (or S 1) by a 56-44 vote, throwing into question legislation that had previously enjoyed a broad consensus of bipartisan support in the last Congress. In an attempt to underscore the Republican Party’s pro-Israeli bonafides, Senate Majority Leader Mitch McConnell (R-Ky.) pushed to take another vote on the package Wednesday, drawing the ire of pro-Palestinian activists. The act, sponsored by GOP Senator Marco Rubio (R-Fla.), combines four bills that had previously failed to advance in spite of the overwhelmingly hawkish pro-Israeli mood on both sides of the aisle. Flagship Zionist lobby group, the American Israel Public Affairs Committee (AIPAC), has made ramming through the package its top priority. Among the items included is one which would enshrine into law the $38-billion military aid package to Tel Aviv over 10 years which Israeli Prime Minister Benjamin Netanyahu and then-president Barack Obama had agreed to in the waning days of the Obama administration in 2016. The bill was blocked by Sen. Rand Paul (R-Ky.) last year. 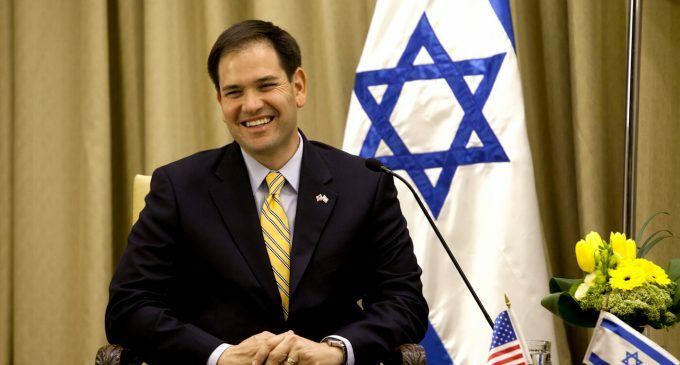 Title 4 of the bill is Rubio’s Combating BDS Act, which has come under fire from civil libertarians and rights defenders for its attacks on the constitutional right to free speech, specifically those related to the pro-Palestinian movement to boycott, divest from and sanction the Israeli state. The act gives state and local governments the legal authority to halt business with companies or individual citizens contracting with state or local government who are involved in the boycott of goods originating in Israel or illegally-occupied Palestinian land. Previous versions of the bill included possible jail time as punishment for U.S. companies participating in boycotts targeting Tel Aviv or illegal Israeli settlements in the Occupied Territories when those boycotts were backed by international governmental organizations such as the United Nations. The same would apply to boycotts targeting any other country deemed “friendly” to Washington if the boycott was not sanctioned by the U.S. government. Twenty-six states, including New York and Texas, have previously adopted laws that would punish companies that boycott Israel, while two federal courts have sided with free speech advocates. The Combating BDS Act would allow states to pursue their own legislation to crack down on pro-Palestinian BDS advocacy. Last October, a federal judge in Arizona ruled that similar legislation enacted by the Arizona legislature was unconstitutional. The law, passed by the state’s legislature in 2016, required that all businesses contracting with the state submit written pledges that it is not involved in any boycott targeting the Israeli state. Now reaching day 19, the partial federal shutdown has seen thousands of government employees face either prolonged furlough or work with pay. Throughout the drama, there has been one notable exception to the shutdown – the over 500 members of Congress who are still receiving their pay. The Combating BDS Act has now become hostage to the dynamics of partisan contention within the U.S. Senate – a possible silver-lining to the ongoing drama surrounding the shutdown. The post GOP Plows Forward as Democrats Block Anti-BDS Bill in Senate Amid Gov’t Shutdown appeared first on MintPress News.